His groundbreaking career was as much about style as it was about music -- David Bowie plundered a wild array of influences to redraw the boundaries of fashion and blur the lines between masculine, feminine and other-worldly. Throughout his heyday in the 1970s and beyond, each new album and sound was matched by a radically new look, bringing a dimension of performance art and daring experimentation to the world of pop music. 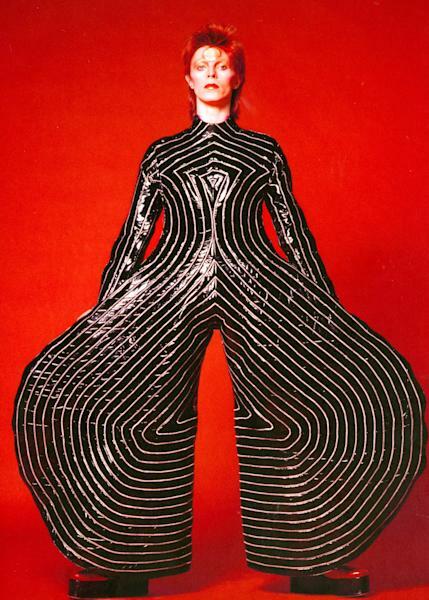 Among the most memorable outfits: the huge, billowing trousers in black vinyl and white stripes from his Aladdin Sane period in 1973, inspired by Japanese kabuki theatre. Or the iconic appearance on British TV show "Top of the Pops" a year earlier, with his shock of fiery hair and gender-bending outfit in gold, red and azure blue -- inspired by the dystopian futurism of Stanley Kubrick's "A Clockwork Orange". The gang of "Droogs" in the film, Bowie drily commented, were "Ultraviolence in Liberty fabrics," referring to the famous London fashion store. Some of his styles were just too much for censors to stomach. A cobweb bodysuit -- with two hands clutching the chest -- designed by Natasha Korniloff for a Ziggy Stardust show in 1973 had to be modified at the insistence of a US TV network to remove a third hand thrusting up between Bowie's legs. He also used Korniloff for one of his more striking costumes -- the blue Pierrot outfit that featured in his "Ashes to Ashes" video in 1980, recalling a classical clown and 17th century theatre. Bowie always had an eye for emerging fashion talent. 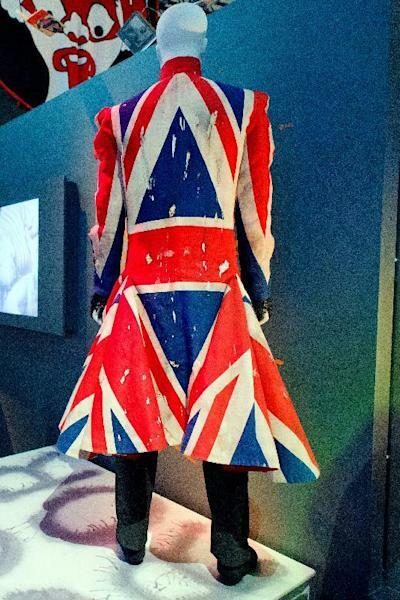 In 1997, he solicited Alexander McQueen, then a young graduate, to design his Union Jack coat, inspired by that of Pete Townshend from The Who. "He mixed a very punk aesthetic -- rips, cigarette burns -- with this tradition of classic British tailoring, which is very Bowie," said Victoria Broackes, who helped curate a highly popular exhibition of the singer's clothes and style. "At the time, Alexander McQueen was not yet well known to the public. But Bowie always knew how to work with the most extraordinary and interesting guys," she added. The retrospective, which first appeared at the Victoria and Albert Museum in London in 2013, underlined the extent of his influence on fashion and his enduring popularity as a multimedia artist. "David Bowie Is" was the museum's fastest-selling show of all time, and brought together everything from baby photographs to painstaking sketches of designs for his own costumes. "His radical innovations across music, theatre, fashion and style still resound today in design and visual culture and he continues to inspire artists and designers throughout the world," the V&A's director Martin Roth said at the time. Even in his early days, appearing with bands The Kon-rads and The King Bees, Bowie had an instinctive grasp of the power of image, meticulously designing the fledgling groups' costumes and stage sets. He went on to take obsessive care over every aspect of his appearances, from lighting to graphic design. The exhibition travelled the world, including an important stop in Berlin where Bowie spent three influential years in the late 1970s. That was the period of his slick Thin White Duke persona that spawned a trilogy of groundbreaking albums: "Low", "Lodger" and "Heroes". All were recorded at Hansa Studios, overlooked by the guard towers of the Berlin Wall. "It was here that he seemed to escape his demons, to throw off creative burn-out and rejuvenate his inspiration," said Broackes. Wearied by fame, trying to kick a cocaine addiction and drawn by new electronic music, Bowie arrived in still war-scarred West Berlin in 1976 where he indulged his fascinations with German Expressionism, the 1919-1933 Weimar Republic and the buzzing subcultures of the 1970s. "It's a city that's so easy to 'get lost' in -- and to 'find' oneself, too," Bowie said in 2001. His love affair with Berlin fed not only his personal style but also that of his friends, leading to the iconic image of US rocker Iggy Pop on his album "The Idiot" in 1977, which Bowie produced and photographed. The East German Stasi secret police feared Bowie's attraction, with files showing their concern that a 1987 concert in front of the Reichstag in West Berlin would draw young East Berliners to listen across the Wall. His love of Germany was always reciprocated, even beyond his death on Monday when the German foreign ministry wrote on Twitter: "Good-bye David Bowie. You are now among #Heroes. Thank you for helping to bring down the #wall."